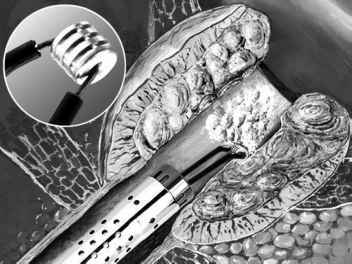 Figure 24 Electovaporization of the prostate using a TURP VaporTrode™. and the usual complications that are associated with these forms of anesthesia can occur during a TURP. The introduction of either spinal or general anesthesia can result in hypotension or a drop in blood pressure. Bleeding can occur with a TURP, and it is correlated with the size of the prostate and the duration of the operation; however, it should be emphasized that significant bleeding is uncommon when an experienced urologist performs the TURP. Extravasation or perforation of the prostate can occur during a TURP. This causes some of the irrigation fluid used during a TURP to extravasate, or leak outside the prostate. If the patient is awake under spinal anesthesia, this can result in nausea, vomiting, or abdominal pain. Most often, this complication can be managed by cessation of the operation and urethral catheter drainage. As with bleeding, extravasation in the hands of an experienced resectionist is uncommon. The most dramatic complication that occurs intraop-eratively or in the immediate postoperative period is TUR syndrome. TUR syndrome occurs when there is too much absorption of the irrigation fluid and resultant lowering of the salt level in the blood, hyponatremia. The manifestations of the TUR syndrome include nausea, vomiting, brachycardia or slow heart rate, and visual disturbances. The treatment of the TUR syndrome is principally diuretic medications, which help the patient urinate out the excess fluid that has been absorbed. Some urologists will also give high concentration saline or high-concentration sodium solutions to increase the serum sodium. In most circumstances, the TUR syndrome can be corrected in the immediate postoperative period. Recent studies report that blood transfusions are required in about 4% of the patients who undergo the procedure. Because the apex of the prostate is near the external urinary sphincter, incontinence is a potential complication. Fortunately, the risk of urinary incontinence after a TURP has been estimated to be about 1%. Erectile dysfunction or impotence can occur after a TURP. It is theorized that some of the electrical current from the resectoscope loupe scatters beyond the prostate capsule and injures the nerves. Other complications include urethral stricture and urinary tract infection.